SYMPTOMS: The patient presented with a severe headache, facial paralysis and bi-lateral facial weakness. 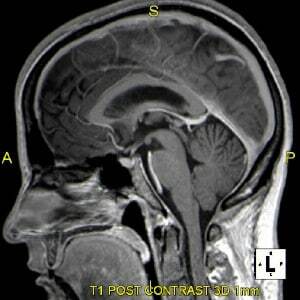 Patient had been previously diagnosed with Bell’s Palsy. 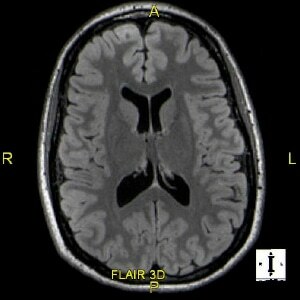 The consulting neurologist referred the patient to Siker Imaging for a high resolution 3T MRI of the brain with and without contrast. High resolution images were obtained. In addition to the MRI, a sequence was performed to screen the cerebral vasculature which unveiled a small extradural cerebral aneurysm. 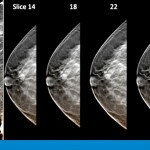 Representative images with pathology clearly labeled and annotated are presented below for review. 1. There is enhancement of the bilateral facial nerves within the IAC (intracanalicular portions), as well as at the labyrinthine portions. Findings are consistent with clinical history of Bell’s palsy. 2. 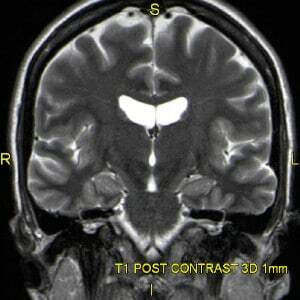 The remainder of the Brain MRI with and without is normal. 3. 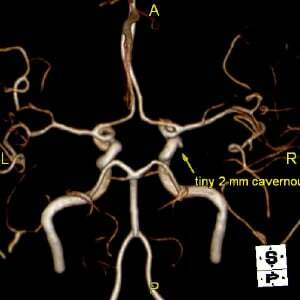 There is a tiny (2 mm) extradural cerebral aneurysm at the proximal horizontal portion of the right cavernous carotid artery. I think that this aneurysm is extremely low risk. One could obtain a follow-up MRA in two years to show stability. 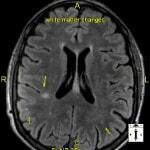 Otherwise, normal screening MRA of the intracranial vasculature.